There are a few basics that need in order to make a good lasagna. First, you need a good, deep lasagna pan. I actually recommend a standard 13″ pan AND a smaller 8″ or 9″ square pan to make half size lasagnas. The 8 inch pan is great for serving 2-4 people if you don’t want a lot of leftovers. I like Emile Henry bakeware, but you can certainly find bakeware that is less expensive and will work just as well. I also recommend a good spatula for lifting the lasagna out of the pan. A non-stick one is best, but you can spray any spatula with non-stick spray to get the same result. When it comes to noodles, I don’t understand why anyone would par cook their noodles. It is much easier to just use a no-boil style of noodle. The no-boil style tends to be thinner, so they are also great for making many-layer lasagnas. You can even use regular lasagna noodles, not specifically marked as “no boil”. They turn out just the same as the “no-boil” kind. Just keep in mind that if you are working with a thicker lasagna noodle, you may need to add a little more cooking liquid or sauce and you may need to bake the lasagna a little longer. There are a few keys to making good vegetable lasagnas. First, you need to cook and season your vegetables before adding them to the lasagna. 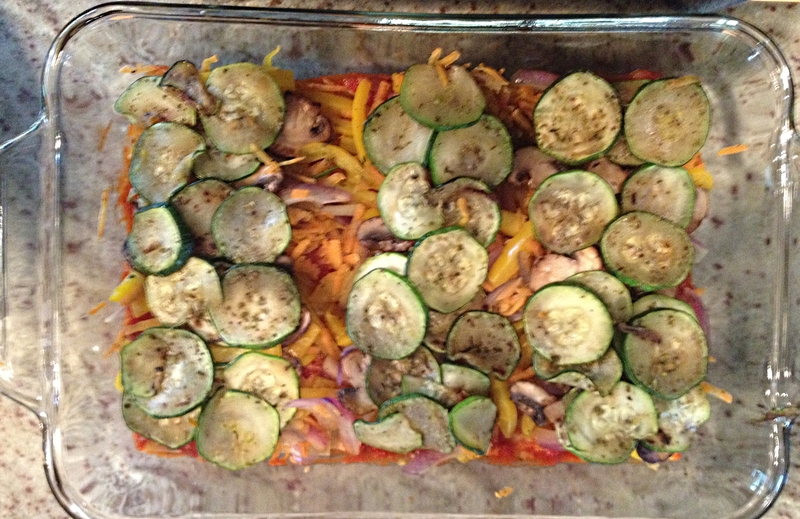 Raw and unseasoned vegetables are not going to suddenly turn delicious as the lasagna bakes. Vegetables like onions, fennel, peppers, zucchini, and dark leafy greens should be sauteed to get some caramelization and seasoned with salt, pepper, and herbs. Squashes should be roasted and removed from their skins. Use enough liquid, but not too much. The pasta in lasagna needs liquid to cook and absorb in order to yield an al dente texture. Prior to adding your first layer of noodles, you need to put some liquid in the bottom of the pan. For a half-lasagna, about 1/2 a cup should work. For a full size lasagna you will need about 3/4 cup. If you are working with fairly dry ingredients, like vegetables that have already released most of their moisture, you should make sure to add some sauce with each layer of noodles. However, avoid adding too much of a thin sauce or cooking liquid, or you will end up with lasagna soup. Another thing that you need to remember when cooking lasagna is to season liberally. When you cook pasta on the stovetop, you add it to generously salted water so that the pasta is flavored by the salt. Keep that in mind when you build your lasagna layers. If your liquid or sauce is sufficiently salted, you should be fine. I season each layer of the lasagna as I prepare it. Lasagna should be cooked covered until the end of the cooking time, at which point you should uncover it to allow the top to brown. My lasagna pans do not have lids, so I cover them tightly with foil before baking. I coat the underside of the foil with a little olive oil spray so that the top of the lasagna doesn’t stick to the foil. Plan on baking your lasagna for 45 minutes to an hour. I typically bake mine covered for 40 minutes, then uncovered for an additional 10-20 minutes. You will need to let the lasagna rest for 10 to 15 minutes prior to serving to allow it to set up – so factor that into your cooking time as well. Now that you know the basics, you’re ready to get cooking . . . 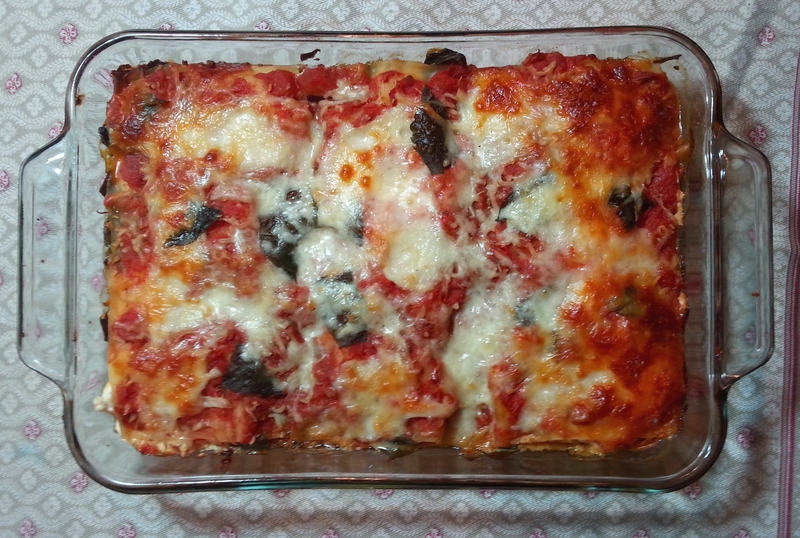 This lasagna is a simple, Italian-style vegetable lasagna with zucchini, peppers, mushrooms, spinach, onions, carrot, cheese and tomato sauce. You could easily make this lasagna by substituting tofu “ricotta” and omitting the top layer of cheese. A breadcrumb topping makes a nice replacement for the cheese by adding interest and texture. A hearty vegetable lasagna that is a year-round crowd-pleaser. Browning the mushrooms and sauteing the vegetables with herbs adds flavor and creates the appropriate flavor and consistency for the finished dish. 8 oz ricotta cheese I like Coach Farms goat milk ricotta, which is lighter and less fatty than traditional ricotta. Heat 2 TBSP olive oil to medium heat in large sautee pan or cast iron skillet. Add 1/2 sliced mushrooms and cook for ~3 minutes without stirring until mushrooms are browned on one side. Turn mushrrooms and cook for another 3 minutes until browned. Removed cooked mushrooms from pan. Add another 2 TBSP oil and remaining mushroom and cook for three minutes or until browned on both sides as described above. Remove mushrooms from pan, season with salt and pepper, and wipe out pan with paper towel. Return pan to heat and add remaining 1 TBSP of oil to pan. Add onion, pepper and garlic to pan and sautee until softened, about 4 minutes. Remove onion, pepper and garlic, place in a small bowl and set aside. Add zuchinni to pan and sautee for ~3 minutes until softened. Remove zuchinni from pan, add to pepper and onions and season mixture with oregano, marjoram, crushed red pepper, half of torn basil leaves, salt and pepper. Add 3/4 cup of tomato sauce to lightly oiled 13" lasagna pan and spread out to cover the bottom of the pan. Place three lasagna sheets on top of sauce. Top pasta sheets with cooked vegetables, 3 handfuls of raw spinach and carrot, and mama lils peppers (if using). Place three more lasagna sheets on top of vegetable mixture and top with another 3/4 cup of tomato sauce. Place ricotta on top of sauce covered noodles, making sure that ricotta is evenly distributed across all three lasagna sheets. Add remaining three handfuls of raw spinach, season with salt and pepper, and top with remaining three lasagna sheets. Top final layer of noodles with remaining 1 1/2 cups of tomato sauce and remaining torn basil leaves. Season top layer of pasta with salt and pepper and top with mozzerella. Place lasagna, tightly covered with foil, into 350 degree oven and cook for 40 minutes. Remove foil from pan, return to oven, and cook for 15 minutes more. Remove lasagna from oven and allow to set for 10-15 minutes before cutting and serving. *Mama Lils Peppers are an amazing artisan product made in Seattle.